The humble pot holder is more important and more useful in the kitchen than some people give it credit for. It might seem like a simple kitchen tool that you can get anywhere but there are actually a lot of different types of pot holders out there. Some have been equipped with new technologies that can provide better comfort and protection when carrying that hot pot of stew or holding a stainless steel pan to keep it steady. It’s a good idea to scrutinize your choices, so you can get pot holders that you will be able to use for a long time. We checked the market for ideal options and found those that are durable, can protect your hands from getting burned and those that will look great in any kitchen. Read on to learn more about our recommendations. You would be surprised how many types of pot holders there are out there. They differ when it comes to materials used. This is the most common type of pot holder. You might have seen this around plenty of times and you might even have one in your kitchen. These are generally made from cotton but can also be made from other fabrics like linen. The inside can be lined with a special kind of foam that provides a protective barrier between your skin and the heat of the pan. These days, you can find pot holders made partly or entirely from silicone. 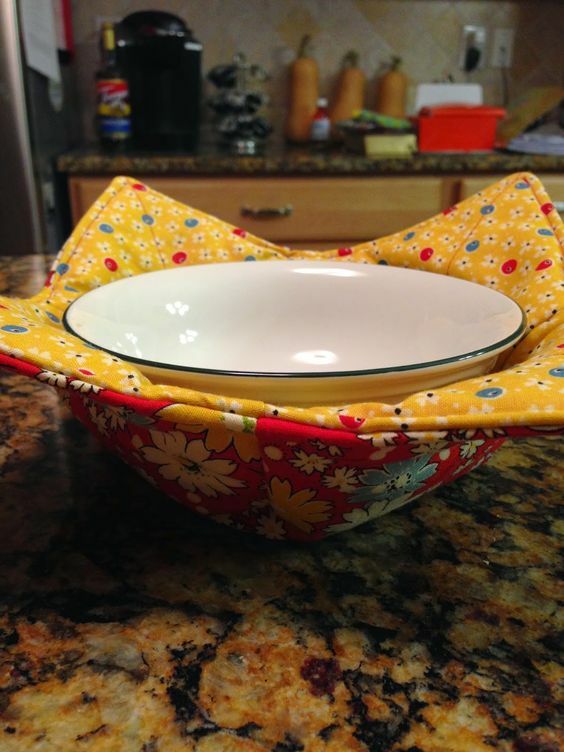 This material is great for oven mitts or pot holders because it is heat-resistant. It is also flexible, which gives users more comfort when using them to hold pots and pans. 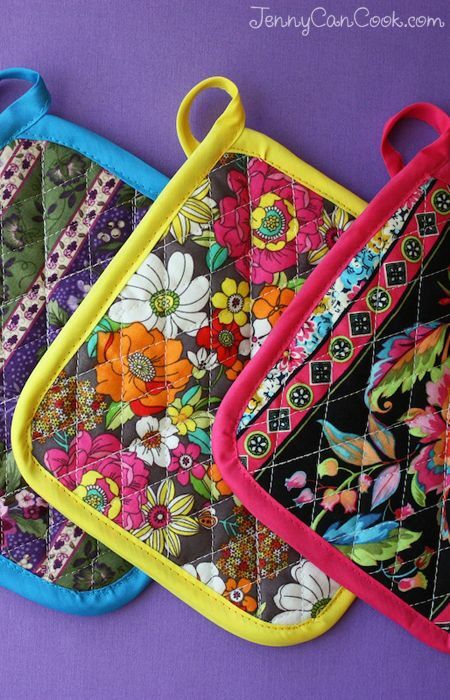 This affordable pot holder comes in a set of four pot holders or mitts. It is made from 100% cotton material and has a thicker feel to it. 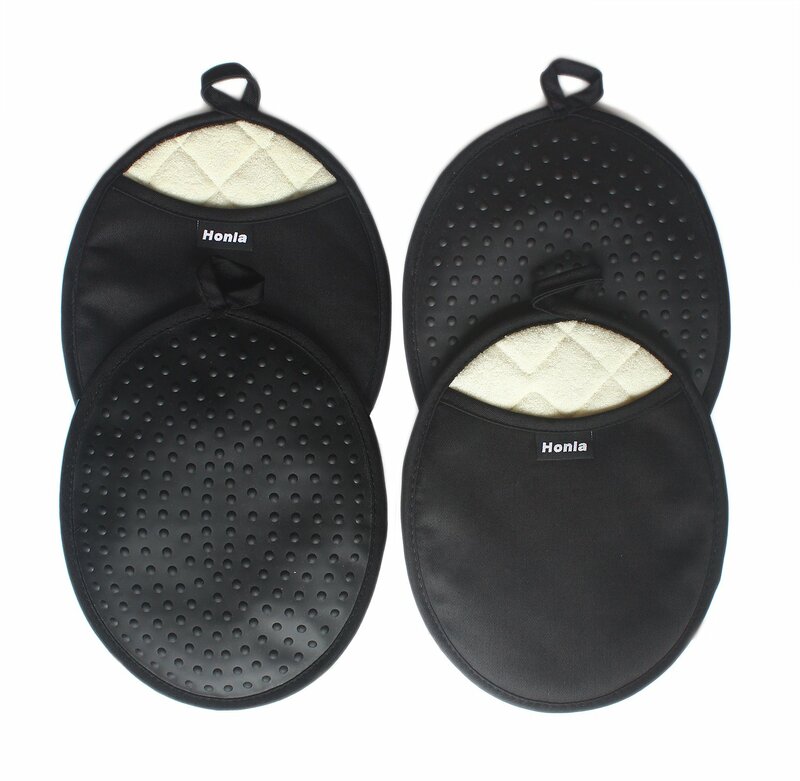 It protects your hands from hot pots and pans without sacrificing flexibility and comfort. Although it is thick, you can still hold handles of pots with ease. Each pot holder in this set measures 8.5 inches in length and 5.5 inches in width. The size is just right for average hands. It feels thicker than cheaper oven mitts or pot holders out there. Heat won’t transfer easily to your hands and you can securely hold to the handles. Many customers said it has a generous space for your fingers. They last for a long time. Even with frequent use, they still hold up quite well. A lot of people also like how light they are despite being thicker. It isn’t cumbersome to use. Slipping your hands into these pot holders is easier compared to an oven mitt. It literally just takes seconds, so if you are looking for something that is easier to use, try this one. Some said it feels a little stiff at first but with frequent wear, it should become softer and more pliable. This affordable set comes with 10 pot holders. Each one has a 6 1/2 inch by 6 1/2 inch size that is easy to use. With its blend of cotton and poly material, you can expect this pot holder to last you for a long time, even with constant use. It can also use a table trivet. To keep it clean, just stick in the washing machine. For a pack of ten pot holders, this is one of the most inexpensive pot holders out there. This is an ideal starter pot holder for those who are moving to a new home and in need of kitchen supplies. It isn’t fancy, but it lasts for a long time, even when repeatedly washed in the washing machine. It retains its original color with ease. It seems to have good insulation as well when used as chargers for hot food. It keeps food hot for a longer period of time. These are easy to use. They are soft enough for you to hold the pot handles with ease. Some said these are a bit small for their preferences. Also, it might not be the best option for those with cast iron pots. If you are looking for a complete set of potholders and mitts that will protect your hands or your table from hot pots and pans, get this set. It comes with a set of oven mitts and 2 trivet mats. The trivet mats come in 7-inch by 7-inch size. These are perfect for setting down those hot pans on the countertop or table. Because it is made from silicone, it is capable of resisting high heat. You don’t have to worry that you will burn your hands when taking out a pan from the oven. It even has a non-slip grip, which should prevent users from accidentally dropping heavy pots and pans. These are truly great for protecting your hands from hot pots and pans. Heat doesn’t transfer easily. It can protect you from temperatures as high as 450 degrees Fahrenheit. You can even use this to protect your hands from splatter when turning over fried foods. The silicone material is food-grade. You shouldn’t have to worry about the silicone getting in your food. It protects not just your hands but your wrists as well. The trivet that comes in this package also protects your counter space. It is quite a durable pot holder. Use it for indoor cooking or for outdoor grilling. It is also lightweight. Even if it is made from silicone, it doesn’t feel too heavy. If you do canning at home, try this. It keeps your hands protected without affecting your grip. You don’t have to worry about frayed or stained pot holders. These are easy to wash and maintain. These might not be the most ideal for those with smaller hands. 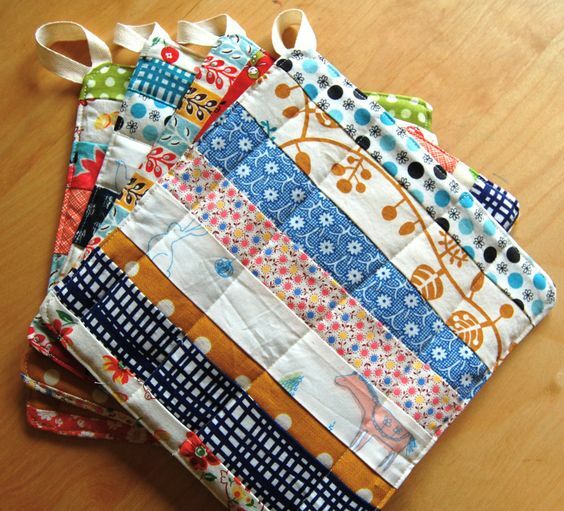 Show your personality with these colorful set-of-four pot holders. They also double as a trivet. With their 7-inch by 7-inch size, these are easy to use and fold. You don’t have to worry about your pot holders getting moldy or stained because these ones are resistant to those issues. They also don’t get smelly. With the ability to resist up to 350 degrees Fahrenheit of temperature, you should be able to comfortably grip pots and pans. This is a versatile pot holder because it can be used as a garlic peeler. Place a garlic on its surface and use this to roll the garlic around. The ridges on its surface will naturally peel off the garlic. You can peel garlic without getting that garlic smell on your hands. These come in fun colors. If you like some color in your kitchen, get these pot holders. The silicone material is resistant to molds, mildew and stains. You also don’t have to scrub them out all the time to keep them clean. They are easy to roll away when not needed. They won’t take up a lot of space in your kitchen. The surface provides better grip, which makes this quite useful as well when opening jars or bottles. You can even use this to peel garlic or use it as a spoon rest, it is that flexible. Be careful not to use the top part where there is a hole used to hang it up. You could inadvertently burn your hand. These pot holders are different from the others because of their oval shape. If you think all the other pot holders you have tried still can’t give you enough heat protection, get this one. It can protect you from heat as high as 500 degrees Fahrenheit. The shape of these pot holders makes them easier to use for baking purposes. You can easily get a pot or pan from an oven with these. It can also protect your hands from cast iron skillets, which is something not all pot holders can do. This has good heat-resistant properties. It can truly protect you from higher heat levels, ideal for sticking your hands in a hot oven. It is comfortable to use, unlike some silicone pot holders and oven mitts out there. Although it has a soft cotton lining, it is still effective in keeping grease at bay. Use these as table trivets or use them to open bottles or jar lids. Some said it is not as flexible as they have hoped. The oval shape of these pot holders makes them unique and compact to have around in the kitchen. They feature a silicone material that can withstand up to 500-degree F of temperature and a raised polka-dot pattern for extra surface traction and non-slip property. The manufacturer promises pot holders that are steam, flame and stain-resistant. Everything about this is completely devoid of BPA. The inside is comfortable to the touch as it is made from a combination of terry cloth and deluxe cotton quilted material. These mitts protect your hands from steam and heat. It features raised polka dot pattern for extra grip. Can be used easily by left or right-handed people. The lining feels soft and comfortable. These pot holders are capable of withstanding up to 500-degree Fahrenheit of temperature. They are easy to store when you are done using them. Inexpensive for a set of 4 mitts. They are not hand-shaped, so you might not have the flexibility that hand-shaped mitts can offer. This pair of silicone oven hot mitts are 13.5 inches in length and features an opening length of 5.5 inches. It offers more protection for your hands and has a substantial opening that will make it easier to get your hand in and out of it. The silicone part features a non-slip grip pattern on both sides, making this ideal for both right and left-handed people. It features 50% cotton inner layer and 50% polyester. You can easily pull it out from the edge for a quick and thorough cleaning. It is resistant to heat of up to 482 degrees Fahrenheit and has superb waterproof functions. They are washable as well, making maintenance a lot easier. This pair of oven mitts are nice to look at. There is a hook that will allow you to hang this pair easily. It is longer, so it has more skin to protect. You won’t feel the heat from the steam or the oven as well and this can even protect you from splatters when frying. Both sides have a grip pattern, so it can be used by both left-handed and right-handed people. The inner lining feels soft. It is quite flexible. Even if it is thick, you can still move your hands around easily. These mitts are completely BPA-free. There were those who said this were too big for them. 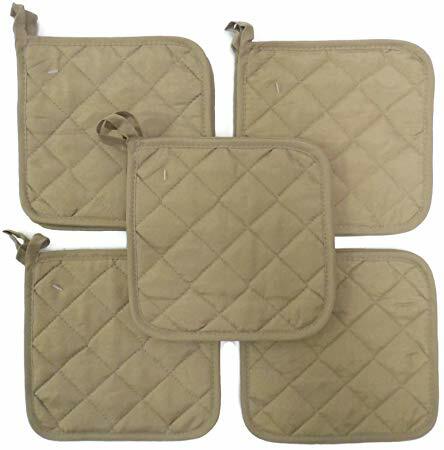 This 3-piece set features one oven mitt and 2 pot holders that come with an individual hanging loop for easier storage. There is a printed silicone design pattern that allows more surface grip. There is no need to worry about those pots and pans slipping. Choose from different fun colors such as blue and yellow but grey should also be a good choice for those with minimalistic kitchens. The price is affordable and accessible considering what you are getting. They are also easy to clean and take care of. These are great-looking mitts. You will love the pattern on them. Many can attest to how well this keeps the heat away. Your hands are protected when using this. The glove has a nice size that will allow you to fit your hands in easily. They can be washed and dried without issues. The price for these mitts isn’t too steep. They look so pretty that you won’t be ashamed to give them as a gift. Some said the hot pads are quite thin and require insulation. Perfect for Smaller Hands: Ritz Royale Collection 100% Cotton Terry Cloth Mitz. This is the most ideal choice for those with smaller hands. 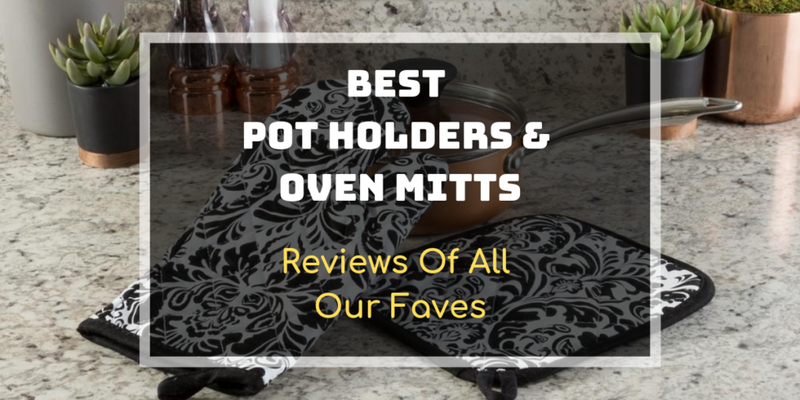 It is still roomy even when you have average-sized hands but those who don’t like big oven mitts or have a hard time finding a pot holder that is easier to handle for smaller hands, this is a great option. 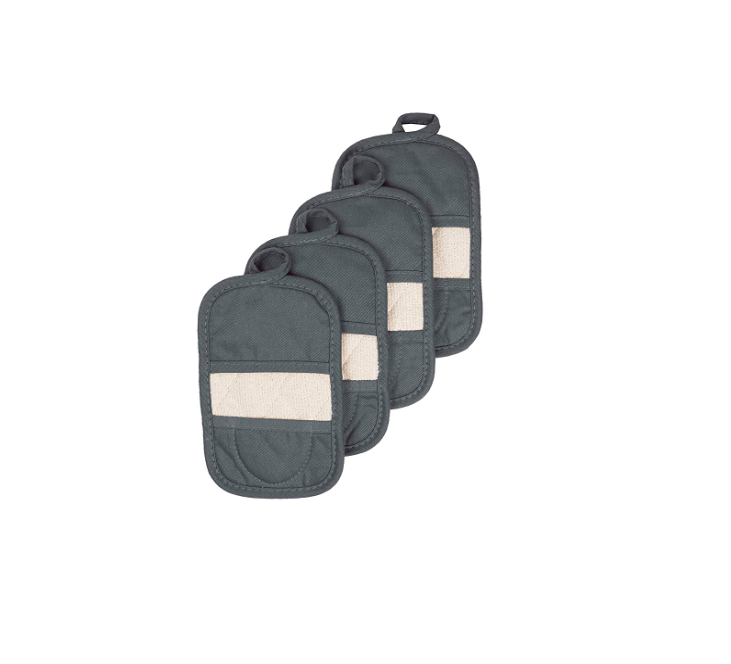 Best for the Budget: American Linen 10 Pack Pot Holders. Get this set of pot holders if you are on a budget but still want good quality pot holders that won’t fail you and will not get damaged easily. Looks Clean All the Time: Homwe Silicone Oven Mitts and Potholders. If you hate dealing with dirty pot holders all the time, get this one. Because it is made from silicone, it doesn’t get stained easily. You can also just easily wash it and dry it if you need to get rid of oil or grease. 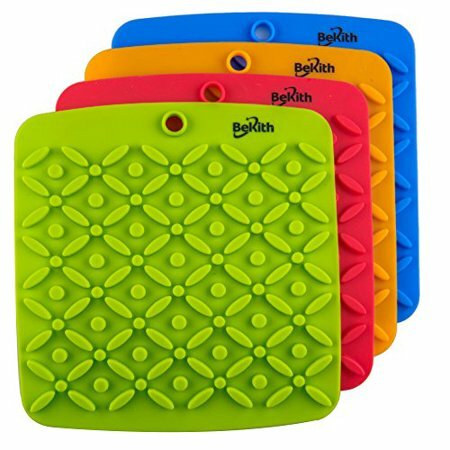 Stylish and Multi-Functional: Bekith Silicone Pot Holder. Get this one if you want a set of pot holders to have multiple functions. It also works as a trivet, a garlic peeler and a spoon rest when not using it as a pot holder. Pricey but Worth It: Cuisinart Silicone Oval Pot Holders. You can rely on these pot holders to protect your hands from higher heat settings. They are nice to look at and they work as trivets as well. Unique Shape and Easy to Store: Honla 4-Piece Oval Pot Holders with Pockets. This pot holder has an oval shape. It will take some time getting used to at first, especially if you have been using the glove ones before but a lot of customers said they didn’t have a hard time transitioning. This is easy to use and works great around the kitchen. It protects the hands from the heat. It is also sturdy and has an affordable price tag. Longer and Better Protective Properties: Frux Home and Yard Grey Silicone Oven Hot Mitts. This is one of the best out there just because it is longer and can protect more portion of your arm. If you often get burned because of steam or when you fish out baking trays in the oven, get this one. It has a longer reach, so it should be more ideal as all-around protection in the kitchen. Great-Looking: Sticky Toffee Printed Silicone Oven Mitt and Pot Holders. You have a lot of color options with this set. They are also capable of protecting your hands from heat while injecting some style in your kitchen. Nobody wants to burn their hands, so finding the best pot holders is key and we've decided that if we were to recommend just one, the Homwe would be our choice thanks to the amazing protection it offers. Decide which one to get based on your needs. If you do a lot of baking, you would want to get something that has silicone materials to protect your hands further from the heat. Otherwise, stick to the less expensive cotton blend pot holders. Make sure they fit your hands well. If the pot holders are too big, you might not be able to grip the pot properly. If they are too thick, they might not be as flexible as you want. Check the size and determine whether this is a size you can work with. Check for loose materials that can catch fire. It might have some loops that might accidentally catch fire. Also find out if it has fire-retardant properties for further protection. Set aside a budget for it. How much should you spend on a pot holder? These are generally not that expensive but if you don’t want to keep on buying them, choose those that don’t fray easily or those that are resistant to stains. If you are getting those fabric ones, choose those that can be easily cleaned using your washing machine. Decide on style and color. If you are following a color scheme or a certain design in your kitchen, choose those that will blend in nicely in your space. If you have a minimalist kitchen, you don’t want to go for those colorful pot holders. Now that you have found a pot holder to rely on, it’s time to complete your kitchen essentials with other tools and equipment that can make cooking and preparing in the kitchen easier. Head to our homepage for some great recommendations and reviews on kitchen products and tools.